Following very quickly and closely to Facebook – Google+ has launched embed posts feature. 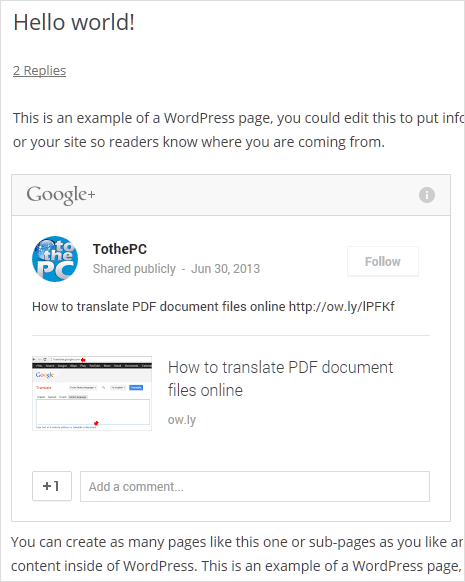 Now users can embed and display Google+ posts on their websites and blogs. Embedded posts appear in a neat user interface design. Users can only embed public posts, this feature is not available for private or restricted post content on Google Plus. 1. On Google Plus website, move your cursor to top right to make drop down arrow button visible. Click that button and then click on Embed Post option. 3. On embedded post box, users can plus the post by clicking +1 button. It shows “follow” button to allows websites visitors to follow specific Google+ page. Users can also comment on the embedded post. If specific embedded post is edited with new or modified content – same changes will appear in the embedded post without you having to update the embed code. With this feature, besides embedding your own Google+ content on website – you can quote notable individuals or brands on Google+ in your articles. You can also display Google+ posts in a Google+ branded frame identifying the source of the content.